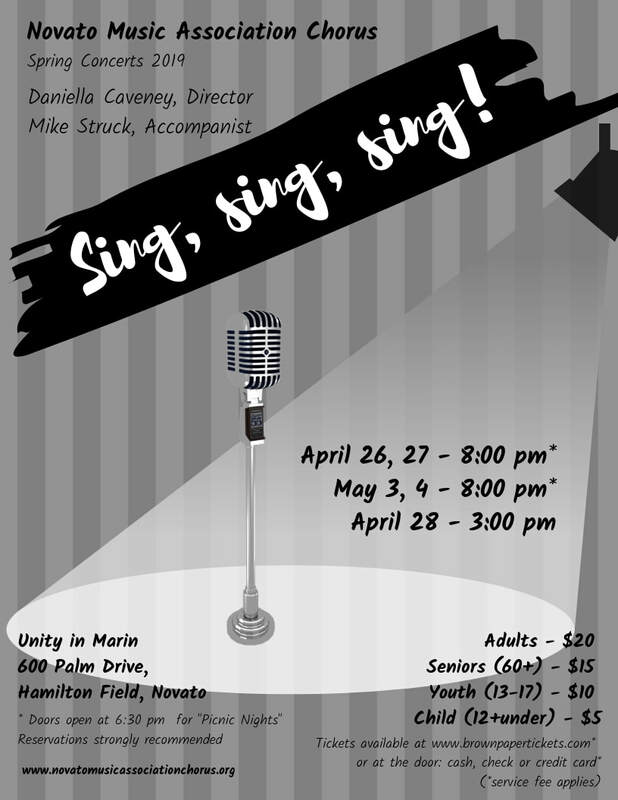 The Novato Music Association Chorus presents its annual spring show featuring familiar tunes such as: "It's a Grand Night for Singing", "Let's Do It", "Don't Sit Under the Apple Tree" and "It's De-Lovely.” This spring, we are featuring songs from the1940's era sung by the whole chorus, small groups, duets and solos. Join us for a high energy, interactive evening or afternoon. The evening shows, April 26 & 27 and May 3 & 4, are picnic nights. Bring dinner and your favorite beverages to enjoy before the show begins with cabaret seating at tables for ten. Reserve a whole table or just a few seats, and make new friends. Reservations are strongly recommended for cabaret seating. Coffee, lemonade and desserts will be for sale. The afternoon show, on Sunday, April 28th, is traditional theater seating with no reserved seats. There will be no picnic at the afternoon show, but coffee, lemonade and desserts will be for sale. Want to Join us in song? ​Email us, and we will let you know how.